From the Legend of Zelda: Breath of the Wild Nintendo Switch video game comes these adorable mini mascot charm mini-figures. Each mini 1 2/3-inch tall mascot charm figure is made of plastic and comes with a chainring for easy display. There are 5 different styles to choose from: Link with a hoodie, Link without a hoodie, Zelda Breath of the Wild logo, Master Sword, and Link Silhouette. Ages 15 and up. 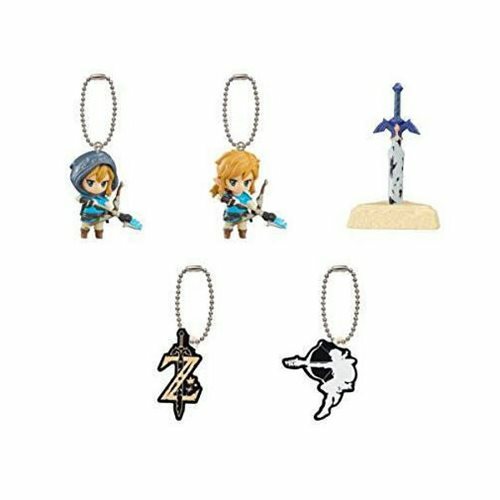 The Legend of Zelda Breath of the Wild Figure Mascot Charm Collection Random 5-Pack contains 5 randomly picked, individually blind packaged mini-figures.